Dreaming of a Southeast Asia diving trip? With its proximity to the Coral Triangle where 76% of the world’s coral species are said to be found, Southeast Asia undisputably offers some of the best diving in the world. Having been on numerous Southeast Asia diving trips and accumulated over 2,000 dives in this epicenter of marine biodiversity, I am so excited to share with you the 11 best scuba diving destinations to inspire your next adventure! In this post, you will learn not only the best places to dive in Southeast Asia but also the diving conditions, the marine life, and the recommended dive operators to help you plan your epic dive trip. Brace yourself because it will be darn hard to get through this post without booking your next scuba vacation! Renowned for the thresher shark sightings, Malapascua is the only destination in the world where these beautiful creatures grace us with their presence every morning. While departing for Monad Shoal’s cleaning station at 05:30 before sunrise may be shocking to most divers, getting a glimpse of the sleek and elegant threshers is one heck of a way to start your day in paradise! Even though the vast majority of divers head to Malapascua for the thresher sharks, it’s hard not to fall in love with Malapascua’s laid-back island life, stunning beaches, and incredible reefs and marine life beyond the thresher sharks. There are many awesome dive sites around the island – be sure not to miss Gato Island, Bugtong Bato, Kalanggaman, and Chocolate Island especially if you love macro! Access: Fly into Cebu, Philippines. Take a 4-hour bus/car ride to Maya port at the north tip of Cebu, then a short 30-minute crossing to Malapascua island. Malapascua Diving Season: Malapascua is open for diving year round, although the wet season is generally between June to September. However, after living on Malapascua for a year, I have to say that typhoons are unpredictable on the island so be sure to purchase travel insurance before you go, to cover any delays or cancellations of your trip. Dive Experience level: All levels of divers can enjoy diving around Malapascua. However, the famous thresher shark dive requires an advanced license due to the depth of the cleaning stations. If you don’t have AOW and have limited schedule, you can easily take a Deep Adventure Course so that you can do the dive to see the threshers. What you can expect to see: Thresher sharks, eagle rays, turtles, frogfish, nudibranchs, seahorses, batfish, ornate ghost pipefish, flamboyant cuttlefish, mandarin fish, octopus, pygmy seahorse, etc. Malapascua Dive Centers & Accommodations: There are +20 dive centers on the small island of Malapascua, but my top recommendation is Evolution Dive & Beach Resort for a one-stop shop. Their dive team is fantastic, and they have clean, modern rooms right on the beach and 2-for-1 Happy Hour at their Craic House! You can’t ask for much more! Click below to read a comprehensive travel guide on Malapascua including how to get there, what to do, where to eat and where to stay! The Similan Islands National Park is a chain of nine islands in the Andaman Sea off the west coast of Thailand. Although there are several popular Thailand diving destinations such as Koh Lanta, Koh Tao, and Phuket, Similan is hands down the best diving in Thailand. The underwater conditions in the Similan Islands are near perfect, from clear visibility, mild current, warm water temperature, to extraordinary marine life. My first liveaboard experience was to the Similan Islands, and I was definitely hooked after that trip! The topside views while cruising around the Similan Islands is just as breathtaking as the underwater world. Depending on your dive safari route, you will likely make surface interval stops on small, uninhabited islands that will take your breath away. The images of a pristine white sand beach shores and turquoise waters will leave you dreaming about Thailand for years to come. Guaranteed. The stunning topside view during a surface interval! To dive the Similan Islands, it is best to base yourself in Khao Lak. Take a flight to Phuket International Airport, then a 1.5-hour shuttle or a taxi ride to Khao Lak. What you can expect to see: tons of fish! Fusiliers, jacks, batfish, snappers, barracudas, boxfish, angelfish, and countless other colorful tropical fishes. You can often find cuttlefish, reef sharks, manta rays, and turtles as well. Similan Island Safaris: While you can sign up for a day trip to some of the Similan Islands from Khao Lak, booking a liveaboard trip (minimum 4 nights) is the best way to explore the magnificent underwater life of the Similan Islands. There are several reputable operators and vessels in Khao Lak, but my top favorites are the beautiful Diva Andaman and the budget-friendly Phinisi. The good news about Thailand liveaboards is that compared to those in Indonesia or the Philippines, they are much more affordable! Similan Accommodations: If you need to stay in Khao Lak before or after your liveaboard trip, I recommend Pratum Resort or Light Khao Lak Resort for comfortable, clean rooms in the town center. Known as the “critter capital,” Anilao’s abundance of fascinating underwater marine life captivates macro lovers around the world. With shallow, calm waters surrounding the peninsula, Anilao is an underwater photographer’s ultimate dream come true. Anilao was one of my favorite macro diving destinations of all times. From colorful decorator crabs disguised as a soft coral to a pygmy cuttlefish that was about the size of a quarter, I was completely mesmerized by the critters in this area. In Anilao, I saw some creatures that I had never seen before, and every dive was a nonstop action of things to see. Oh, be sure to do a night dive when in Anilao – it’s a whole different world in the dark! Conveniently located just 3 hours outside of Manila’s International Airport, Anilao is an easily accessible dive destination that needs to get on your bucket list if you are a critter hunter! Anilao Diving Season: November to May. June to October is the “wet season,” which means choppy seas and poor visibility. What you can expect to see: Every macro life you can imagine 🙂 Blue ring octopus, mimic octopus, cuttlefish, scorpion fish, crabs, shrimps, nudibranchs, frogfish, rhinopias, seahorse, and so much more! Anilao Dive Centers & Accommodations: Since there is not much to do in Anilao except for critter hunting, most of the establishments in the area are dive resorts that offer all-inclusive-packages. I dived with Club Ocellaris and highly recommend them! The rooms were simple, but the local guide was phenomenal, and the food was fresh and plenty. Nusa Lembongan is a tiny island located off of the mainland of Bali where I first fell in love with scuba diving nearly a decade ago. Nusa Lembongan and sister islands Nusa Ceningan and Nusa Penida offer superb diving with beautiful and colorful corals and spectacular marine life. Due to the massive tourism that has spiked on Lembongan in recent years, I was afraid that the underwater world might have been destroyed – but in my recent trip back to Lembongan I was thrilled to find that marine life was thriving and just as stunning as I had remembered! I even saw my first hammerhead shark during one of my sunrise dives at Blue Corner dive site! There are many things to do around Nusa Lembongan beyond scuba diving, such as surfing, stand-up-paddle boarding, snorkeling, beach hopping, and cliff jumping. Whether traveling solo, as a couple or with friends, there is something to do for everyone on this paradise island. Access: Denpasar International Airport in Bali, then a 30-minute fast boat from Sanur to Lembongan. Nusa Lembongan Diving Season: You can dive year-round in Nusa Lembongan, but the popular mola-mola season is between July to September. Keep in mind that the water is much colder during the mola-mola season compared to the rest of the year, and can fluctuate between 18°C to 25°C. Dive Experience level: All levels of divers can enjoy diving around Nusa islands, but some sites such as Crystal Bay or Blue Corner are suitable for experienced divers due to potentially strong and dangerous down-current. There are, however, easy dive sites with gentle slopes that are ideal for scuba diving lessons. So if you are not yet a diver, Nusa Lembongan is a great location to learn to dive! What you can expect to see: Manta rays, blue-spotted stingrays, marble rays, moray eels, mantis shrimp, batfish, mola-molas, nudibranch, reef sharks, and more! Nusa Lembongan Dive Centers: There are nearly 30 dive centers around Lembongan and neighboring islands of Nusa Ceningan and Nusa Penida. My top recommendations are World Diving Lembongan and Blue Corner Dive. Nusa Lembongan Accommodations: Nusa Lembongan is expanding year after year, so there is no shortage of accommodation options that meet all budget types. Click here to browse through the island resorts and homestays, or click on the button to read more about diving in Nusa Lembongan! Ambon is perhaps one of the underrated muck diving sites in Southeast Asia, overshadowed by the critter mecca of Lembeh, Bali, and Anilao. Most divers tend to overlook Ambon but Ambon is the only place in the world that has reported sightings of the rare Psychedelic Frogfish. I was lucky enough to see these magnificent and precious frogfish on two separate occasions during my brief dive trip to Ambon. 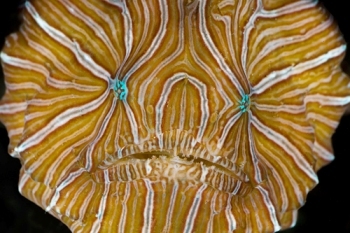 Seeing the Psychedelic Frogfish alone would have made the trip worthwhile, but the excitement didn’t stop there. I also saw my first Psychedelic Batwing nudibranch, along with flamboyant cuttlefish, pygmy seahorses, giant frogfish, rhinopias, and crazy looking crabs and shrimps that looked identical to its surroundings (sand, leaf, stick, etc.). With an abundance of incredible macro life in Ambon, you will never run out of things to see here! Ambon Diving Season: September to May. June to August is generally the rainy season, and some dive shops close during these months. Dive Experience level: All levels, although muck diving is recommended for divers with excellent buoyancy control. Currents: Usually none, but can experience strong current in Maluku Bay. What you can expect to see: Psychedelic frogfish, Ambon scorpionfish, rhinopias, nudibranchs, frogfish, flamboyant cuttlefish, crabs, skeleton shrimps, pipefish, etc. I dived with Dive Into Ambon and stayed at Maluku Resort & Spa which is where the dive shop is based. The two dive shops are situated on opposite sides of Ambon – Blue Motion is located on the Ambon Bay, which is optimal if you are strictly into muck diving. Dive Into Ambon offers diving outside the Ambon Bay, great for divers looking for a diverse experience including reef dives. Click the button below for a comprehensive guide to diving in Ambon! Located in West Papua of Indonesia, Raja Ampat is made up of four main islands Misool, Waigeo, Batanta, and Salawati and is also known as the Four Kings. Raja is indeed THE king of scuba diving destinations in Indonesia. From the stunning coral gardens to countless fish species you will encounter in its seas, some scuba enthusiasts would claim that Raja offers the best diving in Southeast Asia, if not the world. Located smack in the middle of the Coral Triangle, the marine biodiversity in Raja Ampat is nothing like you’d ever seen. Having dived throughout the Pacific, Raja remains my all-time favorite Southeast Asia diving destination. From the mindblowing macro life to intriguing dugongs, the diving spots are so varied that you will never want to get out of the water once you’re in Raja Ampat! If you could plan one trip to go scuba diving Indonesia, make Raja the one. Access: To travel to Raja Ampat, take a domestic flight to Sorong from Jakarta, Manado, or Makassar. Depending on where you will be based, you may need to travel onward to Waisai in Waigeo. Click here for details on Raja Ampat travel including how to get to Waisai. Raja Ampat Diving Season: Diving is available year-round, but the best time to dive is between October to April. Strong winds and rain can pick up from July to August, and surface conditions can get rough during this time. Dive Experience level: Many dive sites are appropriate for beginner divers, but consult your dive operator as many sites are notorious for strong and often unpredictable current in Raja. Currents: Most of the Raja Ampat diving is prone to some current, and operators may require advanced certification. What you can expect to see: Mantas, wobbegong sharks, reef sharks, dugongs, dogtooth tuna, Napoleon wrasse, and giant trevallies are just a handful of usual suspects. On the macro side, you can expect to see frogfishes, pipefish, pygmy seahorses, nudibranchs and a ton of intriguing crustaceans. Raja Ampat Liveaboards: The top dive sites in Raja Ampat are spread out (Batanta, Misool, Fam Islands, Cape Kri, etc. ), so diving on a liveaboard is the best way to explore the BEST of Raja Ampat! Check out Mutiara Laut and Pearl of Papua for the most exceptional vessel options around. For a detailed review on these vessels, check out the post on Best Liveaboards in Indonesia here! To learn more about diving in Raja Ampat including how to get in, where to dive, and how to spend your surface intervals, click the button below for the ultimate guide to Raja Ampat! Tubbataha is without question, the world’s most sought-after dive destination with more than 360 coral species and 600 fish species that make a home in this area of Southeast Asia. Tubbbataha Reefs National Park is a UNESCO World Heritage Site located in the center of the Coral Triangle. This protected marine park has been a base for marine biology research for decades and has been known to host some of the best diving spots in the Philippines. What makes Tubbataha unique and desirable is not only its impressive marine biodiversity but also its remote location that is only accessible by a liveaboard in a short window from March to June. With untouched reefs flourishing in colorful corals and abundant marine life, if Tubbataha doesn’t blow you away I don’t know what will. Dive Experience level: Some dive sites can experience strong currents, but Tubbataha’s atolls and reefs have incredible marine life both in shallow and deep waters. Tubbataha diving is suitable for all levels of divers. What you can expect to see: Pelagics such as thresher sharks, hammerheads, whale sharks, tiger sharks, and manta rays are common, with other usual suspects including Hawksbill and Green turtles, Napoleon Wrasse, schooling barracudas, jacks and trevallies, and more. Tubbataha Liveaboards: Tubbataha National Park is only accessible with a liveaboard. Due to the limited accessibility to Tubbataha, dive cruises book early – sometimes years in advance. So plan early if Tubbataha is on your bucket list (and it should be!). If you want to book a trip of a lifetime, you won’t go wrong with Solitude One or Atlantis Azores! Read more about Tubbataha or other Philippines dive safaris here. Located in northeast Borneo off of Sabah, Pulau Sipadan in Southeast Asia is an unusual island in Malaysia that has been built on top of a nonactive volcano. With steep walls surrounding this oceanic island dropping as deep as 600 meters, the unique Sipadan underwater topography is home to beautiful corals and pelagics that attract scuba divers from all over the world. As Sipadan got on the map as the best diving in Asia, Sabah National Park introduced permit-based entry to protect Sipadan’s ecosystem, allowing only 120 divers to access the protected national marine park on any given day. Due to the limited distribution of the permits to each dive resort and operators in the area, diving guests are encouraged to book an extended stay (3N/4D and longer), as early as possible. Although a permit cannot be guaranteed at the time of booking, the chance of accessing Sipadan Island increases the longer you stay. I was able to get my hands on a permit once during my 3N/4D diving package but met other divers who were able to dive twice at Sipadan – your access to the permit depends on a combination of luck, the timing of booking, duration of your dive package, and which operator you dive with. The closest airport is Tawau, Malaysia via a domestic flight from Kuala Lumpur or Kota Kinabalu. Since there are no accommodations on Sipadan Island, you would need to arrange transportation (~1.5 hrs) to Semporna where you will either book your hotel or continue crossing to neighboring islands of Mabul or Kapalai for alternative lodging. Sipadan Diving Season: Sipadan is open year-round, but the best season is said to be between April and December when the visibility is at its peak. Dive Experience level: Due to the depth and potential currents, advanced certification is strongly encouraged for Sipadan Island. But the surrounding dive sites around Mabul and Kapalai are suitable for all levels. What you can expect to see: turtles, reef sharks, schooling barracudas, jacks, and bumpheads, eagle rays, devil rays, moray eels. You can also find plenty of macro life in nearby Mabul and Kapalai islands. Sipadan Dive Centers and Accommodations: There are various dive resort options around Semporna, Sipadan, and Mabul Island. I dived with Scuba Junkie for my Sipadan diving trip, but I do not recommend them. From amateur dive guide to bed bug infested rooms, Scuba Junkie was the only disappointing experience I had during my Southeast Asia diving trip. If you are on a budget, there are various accommodation options on Semporna from dormitories to homestays. There are dive shops in town as well. But if you enjoy comforts and are looking to book an all-inclusive diving package, go with Seaventures. I have only heard great things from all my dive buddies. Although there are many fantastic dive sites around Bali such as the Nusa islands, Padang Bai and Menjangan Island, there is no dive site quite like Tulamben. Tulamben is perhaps most famous for the USAT Liberty shipwreck, which, due to its shallow depth and accessibility, attracts all levels of divers who want to explore this fascinating underwater historical artifact. But Tulamben is much more than a shipwreck. You can experience a wide range of dive sites along one shoreline, from superb muck diving on black volcanic sand to wall dives that offer colorful barrel sponges and gorgonian fans, all within a 15-minute distance. Whether you are a beginner diver or an experienced underwater photographer, Tulamben is sure to leave you in awe. Access: Ngurah Rai International Airport in Bali. Tulamben is about 3 hours north, along the east coast of Bali. Tulamben Diving Season: diving in Tulamben is possible year-round, but around August and September, the surface can get rough with big waves. Since most of the dives around Tulamben require shore-entry, be very careful during these tumultuous “wave season” – divers are known to get injured every year during this time. Check out other helpful tips on planning a dive trip to Bali here! What you can expect to see: bumphead parrotfish, barracudas, reef sharks, turtles, snappers, Oriental Sweetlips, nudibranchs, crabs, shrimps, pipefish, batfish, garden eels, leaf scorpionfish, etc. Tulamben Dive Resorts: New accommodations are constantly popping up around Tulamben, but my go-to one-stop shop in Tulamben is Toyabali Resort. If you are an avid critter hunter, head straight to Seraya, aka the muck mecca of Bali, and dive with Scuba Seraya. Want to learn more about diving in Tulamben? Click the button below for a complete guide and travel tips on Tulamben diving! Located at the northern tip of Palawan, Coron is also known as the capital of wreck diving. Even though history indicates that over 20 Japanese vessels were attacked and sunk by the US military in Coron during the Second World War, only about a dozen have been recovered and turned into world-famous dive sites. Aside from the astonishing shipwrecks, Coron also offers remarkable underwater landscapes with cliffs, tunnels, and caves that is hard to find elsewhere in SE Asia. Although the sunken Japanese fleets are the highlights of Coron, the idyllic island boasts stunning limestone cliffs, crystal clear lakes, beautiful white sand beaches, and turquoise lagoons that make it a fantastic tropical destination for anyone looking for a paradise getaway. So be sure to schedule plenty of time in Coron, as there is so much to explore both above and underwater on this magical island! Coron Diving Season: Although diving is open year-round, it may be best to avoid the rainy season between July and September. Dive Experience level: The diving conditions are suitable for all levels, but most of the Japanese shipwrecks require an Advanced certification that will allow dive depth to beyond 18m. What you can expect to see: Although you can see some interesting marine life around Coron, the main attraction of Coron diving are the wrecks. So do not expect to discover new marine species in Coron. Instead, explore the historical remnants of WWII, as well as other fascinating dive sites including the Barracuda Lake where you see the salt water meet freshwater to create a thermocline underwater! Barracuda Lake is a sensory experience that you will never forget. Coron Dive Centers: I dived with Raggae Dive Center and can’t recommend them enough. My guide Tom was a top-notch dive guide with eyes of an eagle. Equipment and boat were in good shape, and I had a blast with the Reggae crew! Coron Accommodations: There are many backpacker accommodations in Coron town center such as Bahay Kawayan Backpacker Inn – but if you enjoy a comfortable private room, go with SunValley Tourist Inn located within walking distance to everything you need. Alor is an archipelago located in southeast Indonesia just north of West Timor, known primarily among the diving community. Some speculate that Alor is the “next Raja,” with spectacular diving in the Banda Sea. But due to its remote location, Alor has so far managed to remain under the radar from mass tourism. Diving in Alor is a real treat for scuba diving fans, as it offers a broad spectrum of marine species, ranging from big pelagics (whales and mola-mola sightings are not rare), superb macro life, spectacular coral diversity, to enormous schoolings of fish. While there are now a handful of well-established land-based operators on Alor Island, the best way to explore some of the hidden treasures are with liveaboards, as you can cover more “grounds” with a floating resort. Some dive sites not to be missed are Kal’s Dream, The Cathedral, Mike’s Delight, Paradise Point, The Fault line, Mirror Image, Schools Out, The Bullet, The Backyard, and Coconut Grove. What you can expect to see: Hammerheads, sunfish, and even killer whales have been spotted in the Banda Sea. Muck diving is also popular around Alor, where common sightings include rhinopias, wonderpus, nudibranchs, frogfish, ghost pipefish, and pygmy seahorses. Alor Dive Centers & Accommodations: There are only a handful of land-based dive operators in Alor, and they are quite spread out. If you are looking for Alor accommodations with an onsite dive shop, check out Alami, Alor Divers or Air Dive Alor. Alor Liveaboards: There are over 70 cruises that run dive trips throughout Indonesia. My favorite vessels that run trips to Alor are Tiare and Aurora. Be sure to check the schedule on each cruise, as both liveaboards run various trips beyond Alor throughout the year. With so many amazing scuba diving locations around the Coral Triangle, honestly, it was a struggle to identify the best scuba diving in Southeast Asia. This post is by no means an exhaustive list of all the best dive spots but, I hope it inspired you to begin your scuba trip planning! If you have dived elsewhere in Southeast Asia that you believe deserves a spotlight, please feel free to share in the comments below!